Pressure washing and power washing are relatively easy to explain. They are basically one in the same, just pronounced differently by different people. They both have the same meaning. As a general term used for cleaning an exterior object with water, the term is used in a broad range. 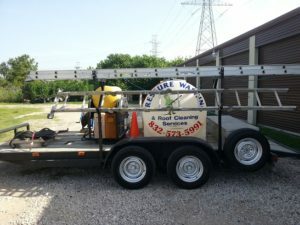 There are many different ways to pressure wash an object, and these different ways are what separate the fly by night companies, and the true professionals. Most surfaces need to be soft washed, rather than pressure washed, and this is why most amateurs damage property on a regular basis. A fly by night company will have your average pressure washer, bought from a department store that has only one power setting. Unfortunately, that power setting is on high, which will damage most surfaces. A professional pressure washing company like Cypress Pressure Washing, has the ability to soft wash surfaces to prevent damage from occurring. 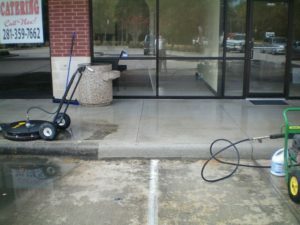 Concrete cleaning and pressure washing is performed on a daily basis by Cypress Pressure Washing. We perform this function on concrete mostly by using what we call our “Surface Cleaner”. 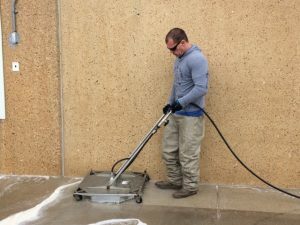 It is our concrete cleaning machine that can cover a larger area, at a faster rate, and cleans more accurately than using the typical wand or spray gun cleaning. Using a surface cleaner helps us get done, and get off your property before we disrupt your daily routine. Instead of performing driveway cleaning in 3 hours, it takes more like 1 hour. 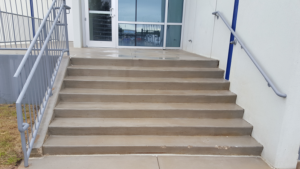 After performing your concrete and brick cleaning, we spray them with what we call our “Concrete Cleaning Formula”. This is our special formula that will stop any new algae, mold, or moss from forming, acting as a preventative, while also killing off any algae, mold, or mildew that typical pressure washing doesn’t remove. This in turn will keep your concrete clean for a much longer period. We also use this technique for brick pavers, natural stone surfaces, and other paved surfaces. Oil stains can be quite difficult to remove. “Can you remove these oil stains from my concrete?” Yes, and maybe no. Oil stains are plain and simple tough. It depends on many factors if oil can be removed with basic concrete cleaning. The most important factor is how long the oil has been on the concrete, and was anything put on the stain already. Long term oil stains are almost impossible to remove completely, since they have had time to set in the pores and dry. 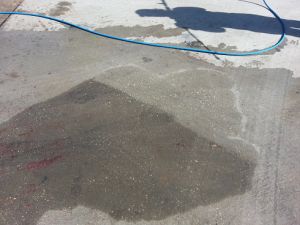 Long term oil stains can be removed enough to were only a shadow of the oil stain is visible in most cases. Another question is what type of oil is it? Some oils are capable of being removed easier than others. And finally, how porous is the concrete? With all these factors going into the removal of an oil stain, it is hard to be able to tell someone that concrete cleaning can remove the oil stain completely. We always recommend performing a full driveway cleaning when removing an oil stain, instead of just cleaning the oil stain alone. Like oil stains, rust stain removal depend on many factors. What is the rust stain caused by? How porous is the concrete that the stain is located in? With these, and many other factors, we can determine what type of treatment is needed for your rust stains. Fertilizer rust stains are one of the more difficult to remove completely with concrete cleaning. Granules left on concrete from fertilizing the yard, or leaking from a potted plant can be one of the hardest rust stains out there. Many times these rust stains cannot be completely removed with basic concrete cleaning, but can be lightened to a faint shadow. A piece of outdoor furniture that causes rust stains can usually be removed with no problems. Call, or email us today for a free evaluation of your rust stains. 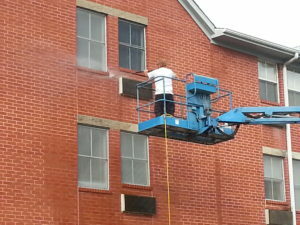 Brick Cleaning is a fairly simple process, in most cases. Most Bricks, like concrete, can withstand higher amounts of pressure, as a result making the removal of mold, algae, and other materials easier. Because some bricks are fragile, we also have soft washing methods for brick cleaning. If you have brick with a white powdery look to them, it could be efflorescence. Efflorescence is usually an occurrence caused by a sprinkler system spraying the brick on a regular basis. In conclusion, we offer a free estimate and evaluation of your property so we will know what method to use to make your home beautiful.